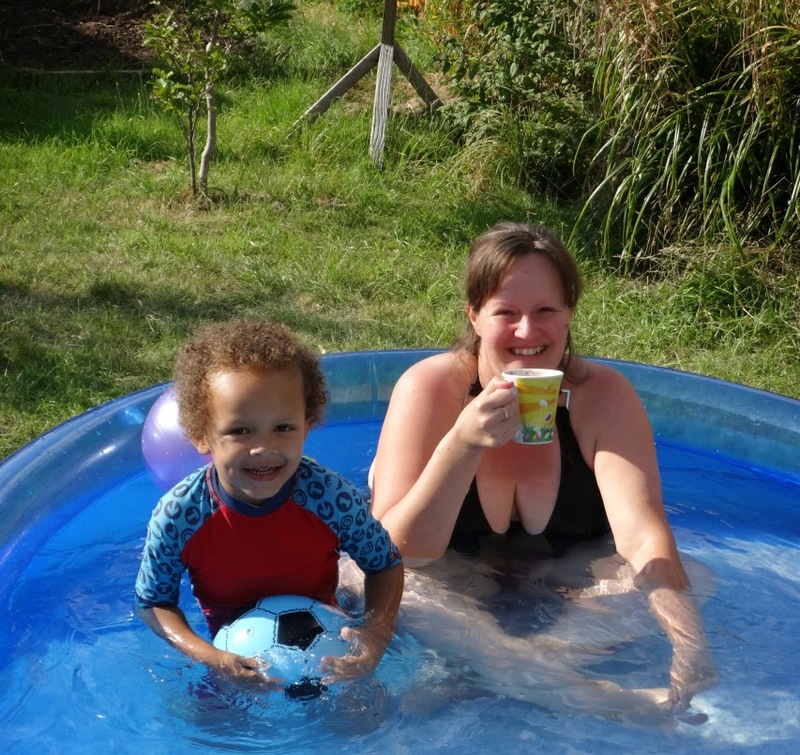 Last year for a few weeks we lived in the paddling pool, but this year I didn't know where the blue plug sockets were, and didn't have the good sense to ask Daddy if he knew. 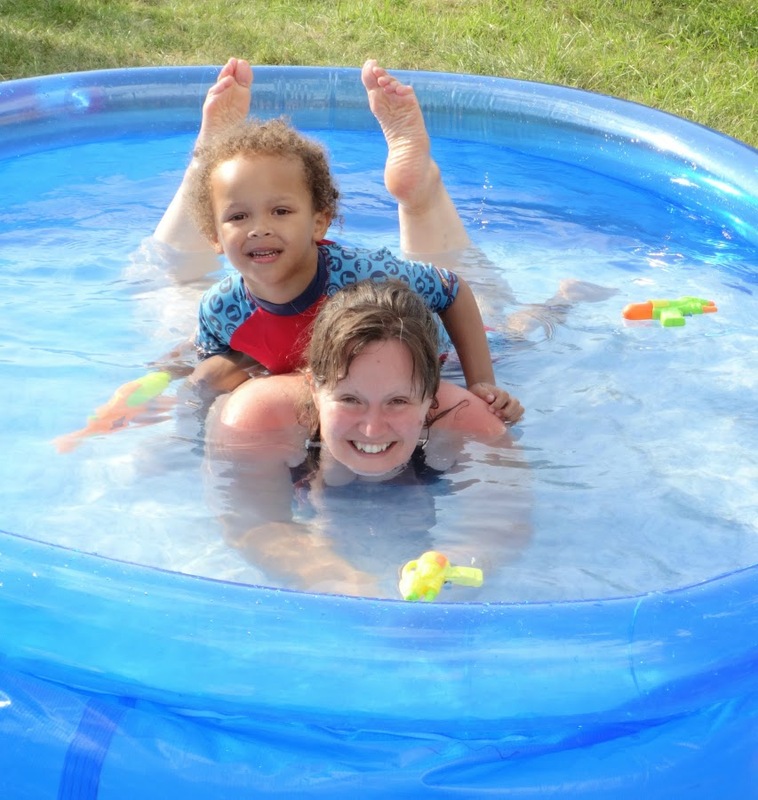 Last week, I found them with his help, and the very next day I couldn't fill up the pool quick enough, so this was us all day Friday. It's the cheapest fab day "out" you could have. All refreshments, and towels just indoors, and no travelling home at the end of a lovely day. I'd recommend getting a large one, as adults get hot too yeah? 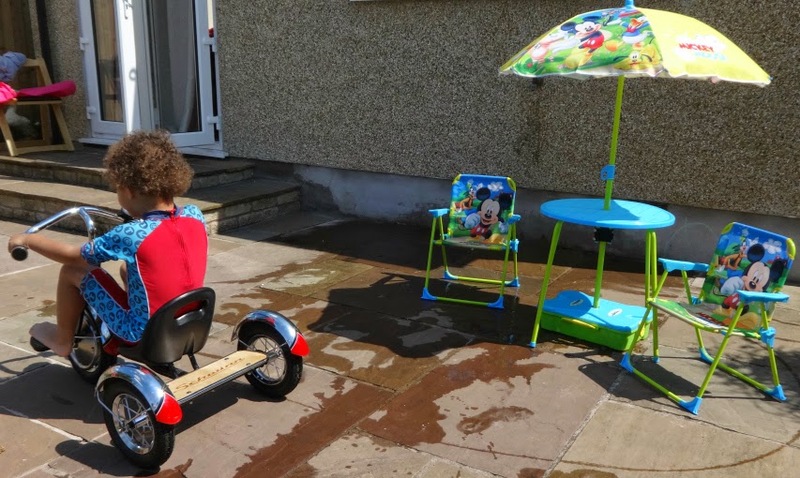 If you only have one for your little ones, you won't believe how much you can cool off and chill out (and enjoy the sun) if you get one you can fit in too. We've even now converted Daddy and he spent Friday evening in there. He now understands why being in there chills me out so much. It's bliss to lie back in it. Ours is a Bestway. Daddy bought it last Summer in B&Q. It's either 8 or 10 ft (not sure) and I think it cost him about 40 pounds. We got it as we were having friends round that day and it was 32 degrees. It's money well spent as it has a lid (well more of a drawstring cover) but it means you can leave it full overnight. I find it only stays clean for about 3 days, but if you have 3 days of good weather in a row, like we often did last year, it really works. You can actually buy a pump which means you only have to fill it once at the beginning of the Summer and that's it. We've not done that yet. It was a fab way to spend a day and I hope the mercury goes high enough in the coming days/weeks for us to do it again, hopefully with his cousins. 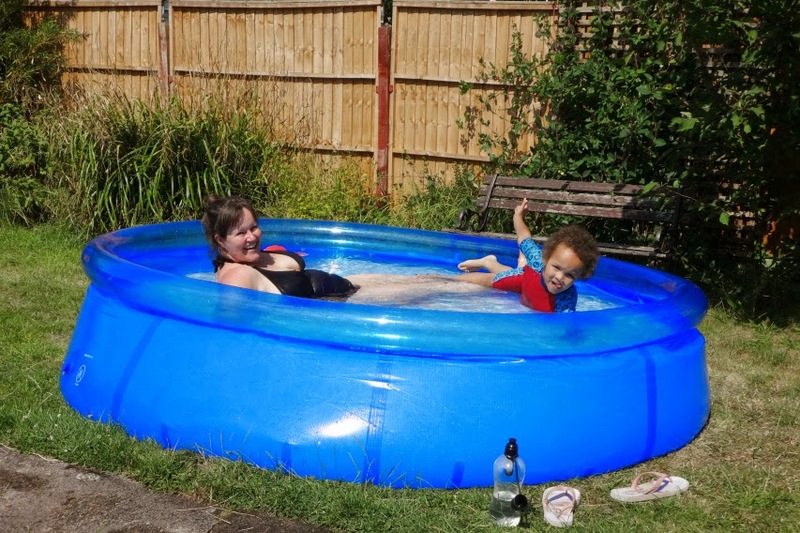 If you get hot easily I can't recommend a paddling pool in your garden enough. For certain sure, getting in is the quickest way to cool down. The kids don't even get thirsty if they are in and out of there on a very hot day. 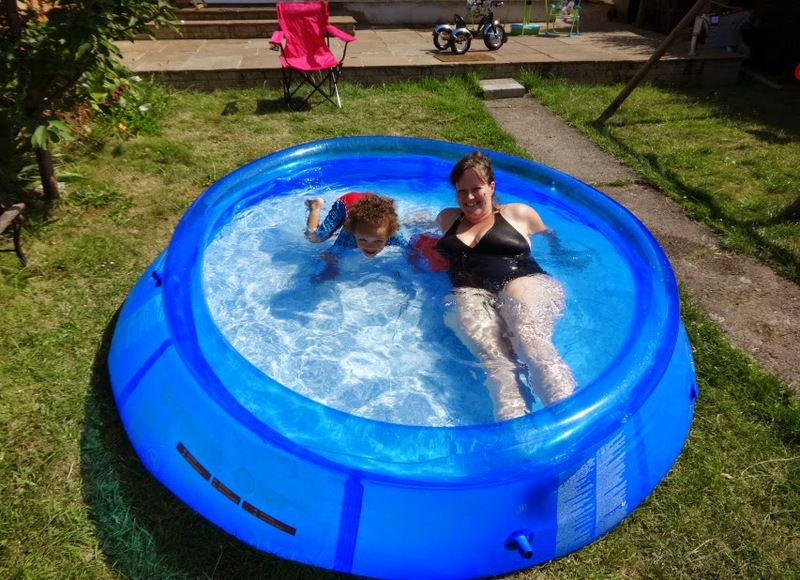 As I was explaining to my friend who lives in a flat, we even had our paddling pool when we also lived in a flat. We had half of the ground floor garden despite being on the 1st floor and we literally just filled it from the kitchen sink - it just means the purchase of a very slightly different hose attachment and job done. My friend literally has a field out the back of her flat so space is not an issue. 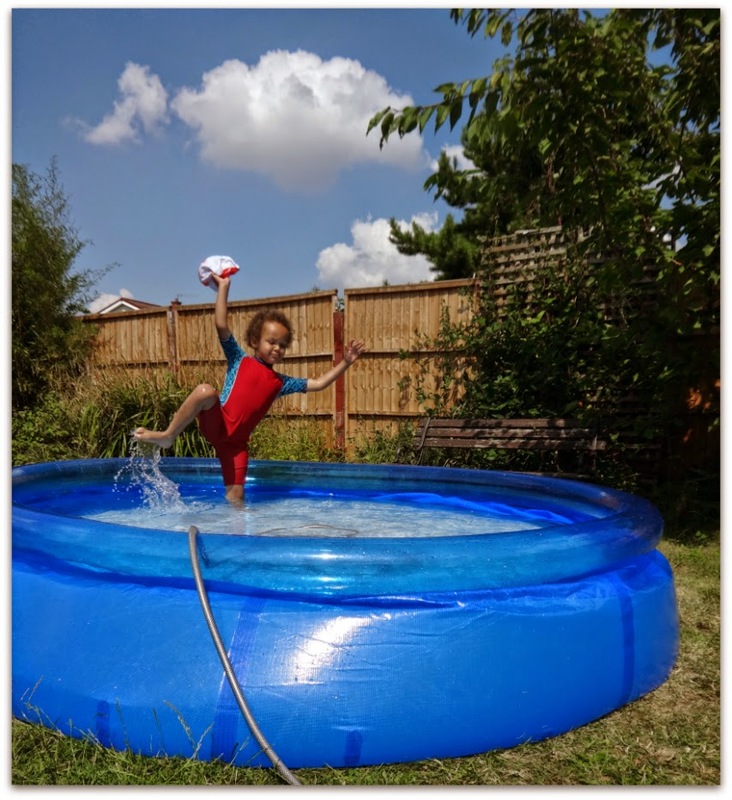 If you get a paddling pool make sure you get one suitable for your needs, there's lots to choose from - as you can see my preference is a pool big enough for the adults to get in too.